Last fall, the cockroach candidate attacked “people who are registered to vote in more than one state.” At the time, an Associated Press reporter recently discovered, his “voter fraud expert” Gregg Allen Phillips was registered to vote in three states: Alabama, Mississippi and Texas. A “voter fraud” investigation recently vanished from political radar. Jonathan Lemire of Associated Press quoted Lindsay Walters as saying on February 3 at the White House, “I do not have an update at this time.” The cockroach President had enjoyed no political “honeymoon.” Less than a day after he took office, millions of protesters had begun to march in more than 600 events held world-wide. This January 21, at least 500,000 demonstrated in Washington, DC, and in Los Angeles, 200,000 in New York City and in Chicago, 150,000 in Boston and many hundreds of thousands in at least 300 other U.S. cities–all together the largest single day of demonstrations in U.S. history. Many more hundreds of thousands demonstrated in London, Paris, Mexico City, Buenos Aries, New Delhi, Sydney, Tokyo and hundreds of other locales on all the continents. The next day, the New York Times dropped its whining about “fact checking” and “errors”–writing that the new President told a “lie” about supposedly winning the popular vote. That seemed to startle some readers of the Grey Lady, but it likely had no impact on voters who chose this President. Sewage clerks: Early last year, the Politico organization dispatched three experienced reporters to review the cockroach candidate and check out the sewage. On average, they found a false statement for each five minutes of public contact. Reporters and news media, repeatedly smeared by the cockroach President, have begun checking every claim and describing what they find. Associated Press posts a “fact check” summary at least once a week. The New York Times publishes “fact check” stories about public events and news conferences. *** This administration is running like a fine-tuned machine…. *** I inherited a mess…. *** ISIS has spread like cancer…. *** The biggest Electoral College win since Ronald Reagan…. *** You probably saw the Keystone pipeline I approved…. No prior President has been so rampantly and casually dishonest. History offers other salient examples in U.S. politics, notably from campaigns against Communism and drugs. At a party conference in West Virginia held in February of 1950, the late Sen. Joseph McCarthy (R, WI) waved a sheaf of papers that he said named “205…individuals..loyal to the Communist Party” and working in the State Department. After years of filth, smears and lies, McCarthy was eventually censured by the Senate. He died in office, likely from alcoholism. Present danger: Clear dangers from an unhinged President are war and financial collapse. An unhinged Walker Bush was left a strong economy and a world in tension but not at war. From him we got Iraq, the September 11 hijack attacks that he was warned about a month before and the worst economic crisis since the Great Depression. It took eight years of an Obama administration to work through the disasters. This entry was posted in Elections, History, Information, People on February 21, 2017 by Craig Bolon. Among the few benefits a Trump administration might have brought was review of energy policies. Only three months after the 2016 elections, however, hostile actions and childish tantrums had cashiered the chance. After that opening, any proposals would be greeted as tainted goods and attacked in federal lawsuits. Stephen Bannon–latter-day Rasputin–had coaxed his proxy, Donald Trump, to rail against climate change as a “hoax.” Props for the accusation came from clannish behavior of scientists starting in the 1990s, trying to manage access to historical data they had carefully combed. Those tactics produced a so-called “Climategate” incident and risked both scientific and political mischief. Limits of knowledge: Climate change and measures proposed to cope with it remain clouded by knowledge issues. Some key factors are intrinsic to the physics of weather. Working at MIT in 1963, the late Edward N. Lorenz, a meteorologist, found, while trying to compute results from apparently straightforward equations representing circulation in the atmosphere, that they would not provide stable solutions. Instead, results would diverge by greatly varying amounts. Comparable behaviors are well known for turbulent fluid flow, and they had been suspected as early as the 1880s for orbits of moons and planets. Lorentz found development of weather patterns similarly lacked predictability. Small eddies could grow into large disturbances. Such effects greatly complicate analysis of climate, which indicates long-term weather. Swedish physicist Svante Arrhenius first estimated the effect of atmospheric carbon dioxide on the Earth surface temperature in 1896. He predicted that a doubling of concentration would lead to a temperature rise of around four degrees Celsius (deg. C). As late as the 1970s, a way to increase the Earth temperature was sometimes welcomed for help in staving off “global cooling” and perhaps another ice age. Early predictions did not consider time dynamics or the many interacting influences–including changes in plant growth, solar output and Earth orbit, clouds, dust, aerosols, surface variations, water-vapor cycles, human activities, methane and other gases. “Greenhouse factors” relating gas concentrations to temperatures remain uncertain to a fair degree. While few laboratory scientists doubt that there are linkages, measuring the factors became a great challenge–complicated by intrinsic unpredictability of weather, by dynamics of exchanges between the atmosphere, oceans and Earth surfaces and by issues of reliable measurements. Historical data before the last few decades proved erratic. A 1956 survey of carbon dioxide measurements from the atmosphere found values published during the 1820s through the 1950s ranging from about 200 to 550 parts per million (ppm) by volume. Its authors proposed to “select” some lower values as representative, but they lacked an approach validated through primary evidence. Improving knowledge: The late Charles D. Keeling, while a geochemistry fellow at Caltech in 1956, began the first systematic survey of carbon dioxide in the atmosphere. He calibrated newly developed infrared absorption spectroscopy against a primary standard from gas manometry, providing much more reliable measurements than previously available. He soon found regular daily and seasonal variations. The Keeling series, measured since 1958 at Mauna Loa, shows atmospheric carbon dioxide already at a steep rate of increase when it began and therefore at an elevated level–a 1958 average of about 313 ppm. During 2016, the average high-altitude concentration in the northern hemisphere rose above 400 ppm. The residual level from the 1600s, after Columbus and before intensive coal mining, was around 280 ppm. Measuring solar output and global average Earth temperature is more difficult than measuring atmospheric gas concentrations. Direct temperature sampling is concentrated within industrialized countries. Every populated location has sources of bias. Solar measurements from the Earth are skewed by effects from the atmosphere. More progress was achieved after the deployment of polar-orbit weather satellites by the U.S. National Oceanic and Atmospheric Administration, starting with Nimbus-7 in late 1978. 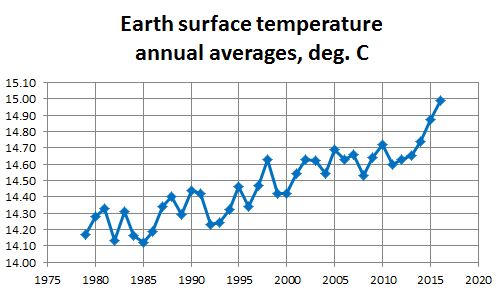 Satellites do not measure Earth surface temperatures directly. They measure infrared emissions from the sun and from the atmosphere. There is no signal to separate low-altitude from high-altitude emissions, so that numerical interpretations are needed to estimate surface temperatures. Those are among many adjustments applied to satellite data. The adjustments have often changed as measurement issues have been discovered. The two series shown indicate strong association between carbon dioxide concentration in the atmosphere and Earth surface temperature, as estimated from satellite data. For 1979 through 2014, carbon dioxide increased from about 313 to 398 ppm, a base-2 logarithm of 0.35, while estimated Earth surface temperature rose from about 14.2 to 14.7 deg. C, an increase of 0.5 deg. C. Those amounts lead to a “greenhouse factor” of about 1.4 deg. C for a doubled carbon dioxide concentration–when about 4 deg. C was predicted by Arrhenius. Controversies: Substantial controversies remain over “greenhouse effect” measurements and their interpretations. The relatively short time spans of reliable measurements–around 35 years–may not be enough to allow mixing between the atmosphere and the oceans. That should produce positive feedback, when warmer temperatures cause carbon dioxide to be released. However, warming effects from greenhouse gases also tend to be offset by cooling effects from human-generated aerosols. The main source of information about atmospheric changes over much longer time spans has come from analysis of ice cores, starting in the 1970s. The longest cores extracted so far trapped air over around a million years of snowfalls. The 1985 Vostok core from Antarctica was the first to span a glacial cycle, providing a look at transitions between low and high temperatures and gas concentrations over geologic times. That inspired mathematical modeling efforts, trying to reconcile factors contributing to observations. Over longer times–from dozens of years to a few hundred years–data from ice cores suggest that the carbon-dioxide increase already incurred from human activity, since the 1600s, can produce temperature increases two or more times more those already measured. 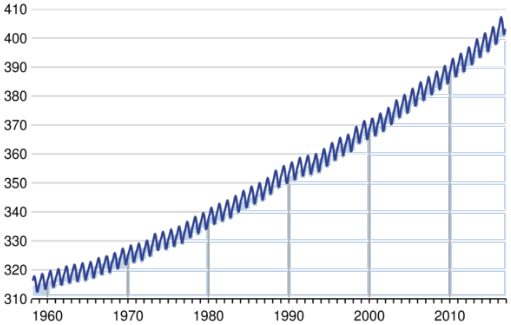 The Keeling series shows that about half the total increase in carbon dioxide has happened since 1980. Research continues at an active pace, still dotted with controversies. This entry was posted in Environment, History, Information, Public health on February 12, 2017 by Craig Bolon.